I read once that one of Hemingway’s sons said a whole trunk of his fly fishing gear was stolen (he shipped it via the RR) and he took that pretty hard. I often wondered what happened with it; if the thief knew the owner, or if it just got sold to some guy in a bar for peanuts… I don’t know if any of his possessions have made it into auctions or whatever (my only interest in collectables are toys I can play with; I have my own fly fishing stuff that is quickly attaining antique status). Ah, the lost trunks! I spent some time as a graduate assistant trying to locate a trunk that had been lost by ex-pat author Kay Boyle. I was helping transcribe her letters for a faculty member, and we both got all excited about the correspondence about the lost trunk, which was filled with manuscripts and personal items and which was never found. Wouldn’t it be great to find these things that have probably long ago been burned or rotted? I think the allure of that possibility drives all kinds of history buffs and treasure hunters, and obviously many people have a longing for any “find” to be real, whether it is or not. Probably there are people who fake trunks of things like Hemingway’s fishing gear as well as art masterpieces. I figure undergraduate students must find themselves imitating their favorite authors pretty often–I sure did. Just a natural part of discovering your voice. I still do it all the time. I read a book I really like, and for weeks I’m writing like that author. Sometimes it’s subtle, other times it’s like a bad caricature. I take it as a sign that I’ve still got plenty of development to go. Thanks for the heads up on the Guardian article. I had not seen it, and it’s fascinating, almost like those folks that I’ve blogged about before who feign serious illnesses for the attention and donations. The case the Guardian reports is not anywhere near the fine line, but, of course, there is also the phenomenon outlined by Harold Bloom in The Anxiety of Influence, whereby poets write derivative work based on the earlier poets who inspired them. I think you’re absolutely right that imitation is a “natural” phase that all writers go through. And I don’t think there’s anything wrong with that. In a way, writing is a sort of conversation about writing, whether that’s articulated or not. I don’t know exactly how this translates to the visual arts. On one level it’s a similar issue–you can copy a painting exactly–here’s another Starry Night or you can produce something else that follows Van Gogh’s style and might be taken for a long lost original. In writing the former is condemned, but the latter is harder to know what to think as long as it’s identified as a pastiche. I know that I have had a few students do brilliant pastiches of, for instance, “Hills Like White Elephants,” where they obviously get Hemingway’s habits, but somehow also use that to leap forward to something their own. I guess visual artists can do that kind of referential work, too, but I think it is more often frowned upon. Copying the masters is a centuries-old tradition, originally serving the need that reproduction prints now serve. What this tradition implies, to me anyway, is the tension between craft and art. The craft of painting is both a severe limitation (most people cannot paint with the control of a master) and a severe temptation (those who can paint with the control of a master can make more money if they fake the master’s vision, rather than explore their own vision). I could be wrong about this, but I think that writing bears less of that tension, since the craft of writing fiction seems easier to master for beginners, and so the burden of artistic vision, of creativity, feels all the greater. The reproducibility of prose itself makes such hoaxes seem redundant, and we don’t venerate discovered texts by the master writers the way we do paintings. 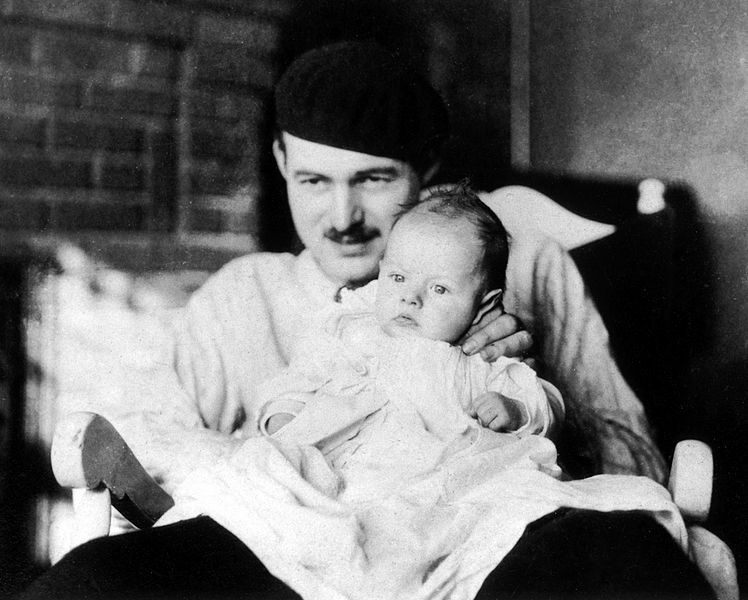 Hemingway’s posthumous book True at First Light was released in 1999. The book was excellent, in my opinion, but hardly influenced the literary landscape. And forging literary documents seems to require a different skill set than the plagiarist or imitator might possess—that would require an archeologist, or an archival specialist. For some reason, I imagine a twenty year old twit trying to hawk the Macintosh Performa 575 that Hemingway wrote A Farewell to Arms on. Great point about the way that writing seems easier to beginners. That’s not only true for aspiring writers, but it’s true for “outsiders” as well–because the medium is somewhat familiar to many more than is paint (or the skill to play an instrument), people think writing is easier than other arts. I will imagine all day today “a twenty-year-old twit trying to hawk the Macintosh Peforma 575 that Hemingway wrote A Farewell to Arms on”! That’ll be fun, but, yes, I agree that the skill set necessary for a text forger would be so different from that of a writer in general. I do remember a Law & Order episode about some forgeries of documents related to the Mormon Church. I would imagine forgery of that kind of document is more common, based on archivists’ and historians’ more applicable obsessions and knowledge. According to wiki, the forger of the fake Hitler diaries (~1983), Konrad Kujau, opened a studio after he got out of prison, selling “original forgeries.” I’m sure the post-modernists approved. I am an artist and believe that there is a lot ot learn from many of the masters. I flirted briefly with “drip splat” painting but found it unsatisfying to my own sensibility. what I mean to say here is that some of the abstract expressionists can be imitated, but each artist has an individual stamp that comes through. Even in Pollock. Color, and most of all the gesture give it a unique look which I’m afraid most often reminds me of good linoleum. The most gross forgeries I’ve seen are of Van Gogh. Granted he did some work that in my view lacks total finish, but there is a strength of composition and color in most of his pieces unparalleled. Thanks, Chris. I believe you are right about Greed. It infects so many aspects of our lives these days.